Laurie Burrows Grad and Peter Grad were together for forty-seven amazing years. The two were inseparable, spending every moment they could together. Then, on vacation in Vail, Colorado, Peter announced he couldn’t breathe. Minutes later he was gone, and Laurie’s world crashed around her. In the aftermath of Peter’s death, Laurie discovered she hadn’t just lost a beloved husband—she’d also lost her social status. People simply didn’t know what to do or say about her newfound widowhood. This is the story of how Laurie recovered from heart-wrenching grief, but it’s more than that. 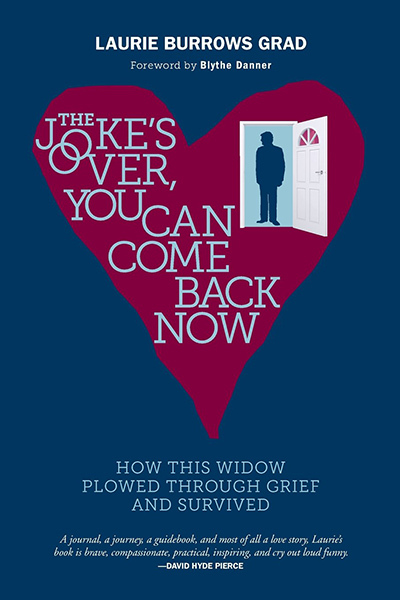 It’s also a manual for grieving widows: a forthright guide to dealing with life alone after years of togetherness. Many widows want to move forward but lack the knowledge they need to do so. Laurie provides that information, and she offers a bit of realism too. With raw honesty and humor, Laurie tackles such issues as sleeping alone, cooking for one, and dealing with financial matters. Grief need not be a forbidden topic, nor does the loss of a spouse have to bring your enjoyment of life to an end. Trust Laurie—you can handle this! Author Laurie Burrows Grad is a grief blogger, cookbook author, television chef, food journalist, and activist/fundraiser. She continues to be an active food writer and is currently the Editor-in-Chief for one of the top food sites on the web, www.epicurus.com, where she contributes regular features on travel and food. On August 1, 2015, Laurie’s husband Peter died suddenly. Overwhelmed by the loss of her husband she began blogging about grief on the Huffington Post Huffington Post Blog. Laurie’s many blogs have helped her deal with her pain and have also helped others, who have responded positively to her honest and raw emotions. This site will chronicle Laurie’s journey through grief as well as inform you of other useful lifestyle and cooking tips that are part of her work.